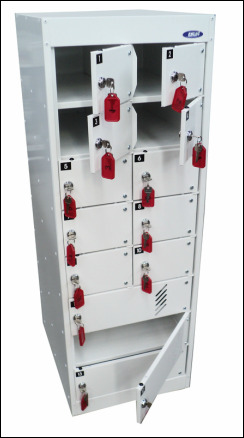 Our range includes 8, 10 or 14 compartment lockers with the option of individual locking doors on each compartment or a single locking door securing all of the locker contents. The individual locker doors & cam keys are numbered for identification. A master key is provided to allow security access should this be required. Lock options include Cam Key locks, Padlock knobs, Combination Locks or Digital Code Locks. 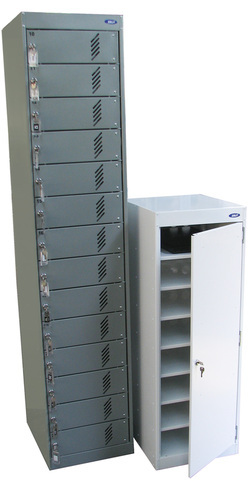 Laptop lockers are also available with a 230v 3 pin electrical outlet within each compartment. This allows individual laptops to be recharged when not in use. A circuit breaker is incorporated to protect laptops should a power surge occur. 28 Level for storage of Laptops and Chrome Books. 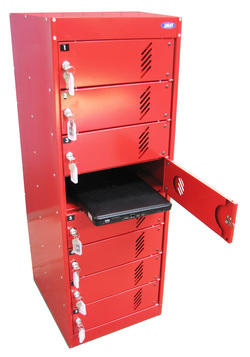 Our cabinets are designed to safely and securely store laptops, cell phones, cameras, iPods, tablets and other electronic devices. Users include Government Departments, Commercial & Industrial organisations, Universities and Educational facilities. Cabinet design options provide the perfect answer for laptop security in classroom environments.